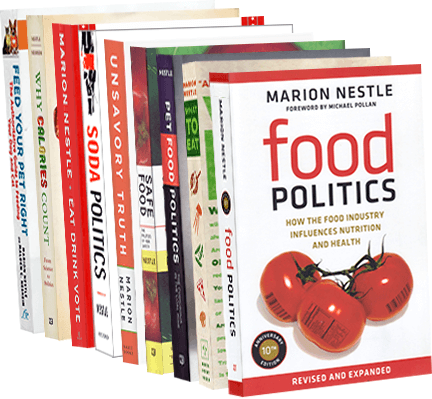 Food Politics by Marion Nestle » The dilemma of pink slime: cost or culture? The dilemma of pink slime: cost or culture? I devoted this month’s (first Sunday) Food Matters column in the San Francisco Chronicle to the current hot-button issue, pink slime. Q: I keep hearing about pink slime being fed to school kids. How could anyone even think about putting something so disgusting in school lunches? A: Pink slime is the pejorative term for “lean finely textured beef,” a product designed to recover useful bits from carcass trimmings. These are warmed, centrifuged to remove the fat, treated with ammonium hydroxide gas to kill pathogens and compressed into blocks that are frozen for later use. The final product is pink; therefore, it’s meat – or so says the meat industry. And from a strictly nutritional standpoint, it is. But from any other standpoint, LFTB creates a dilemma. For one thing, it solves an enormous problem for meat producers. Only about half the weight of the 34 million cattle slaughtered each year is considered fit for human consumption. The rest has to be burned, buried in landfills or sold cheaply for fertilizer or pet food. LFTB recovers 10 to 12 pounds of edible lean beef from every animal and is said to save another 1.5 million animals from slaughter. This is the same argument Mal Nesheim and I used in our book, “Feed Your Pet Right.” If American pets were not fed byproducts of human food production, they would need the equivalent of food for 42 million people. Our readers did not buy this argument. They do not want their pets eating byproducts. They believe their pets deserve food of higher quality. Don’t kids? Here’s the dilemma. LFTB solves a serious food safety problem. The meat trimmings that go into cheap hamburger are said to often be heavily contaminated with bacteria, some of them dangerous. The ammonia processing makes LFTB safe. Since LFTB’s introduction, safety officials say they rarely find toxic E. coli in school hamburger. LFTB’s leading manufacturer, Beef Products Inc., has just announced suspension of LFTB production at three of its four plants. This alarms some food safety advocates. They worry that if public pressure causes LFTB to be eliminated, bacteria-laden beef trimmings will go back into hamburger, just as they used to, and the meat will be much less safe. Under public pressure, some fast food chains, grocery retailers and school districts say they will no longer mix LFTB with hamburger. Walmart will offer customers a choice, and so will the U.S. Department of Agriculture. Calling LFTB “pink slime” presents a massive public relations problem. Human culture determines what is socially acceptable to eat. Most of us don’t eat the parts of animals our culture considers inedible. LFTB is not really slimy and it is reasonably safe and nutritious. But it violates cultural norms. Chef Jamie Oliver proved this with schoolchildren. In one episode of his “Food Revolution,” he made the chicken version of pink slime (white slime?) from bird parts the kids found disgusting. When he formed the slurry into patties, the kids ate them anyway. They forgot about the patties’ origins. But we are acculturated adults. Once we know how chicken nuggets are made, we might want to think twice before eating them. Now we know hamburger is mixed with LFTB. Do we still want to eat it? School food advocate Bettina Siegel collected 230,000 signatures on a letter to the USDA to ban LFTB. She wrote, “It is simply wrong to feed our children connective tissues and beef scraps that were, in the past, destined for use in pet food and rendering, and were not considered fit for human consumption.” The USDA buys loads of LFTB for school hamburger because it is cheap. Districts that choose higher-quality meat will have to pay more for meat. Can they afford to? Of course they can, says my go-to guru for all matters concerning school meals, Kate Adamick. Her new book “Lunch Money: Serving Healthy School Food in a Sick Economy” (cookforamerica.com/lunch-money) shows how schools can buy new equipment and better-quality food by creating strong breakfast programs and cooking meals from scratch. This means that the acceptability of LFTB in supermarket hamburger or school meals boils down to a cultural choice. Even if LFTB is safe, nutritious and tastes like hamburger, it may not be culturally acceptable. Do we want LFTB in our food? Or do we and our children deserve better? Serving healthy and delicious food is a way to show respect for our culture, food, children and schools, and to invest in the future of our nation. Perhaps the best solution to the pink slime dilemma is simply to label LFTB as an ingredient. This would give individuals and schools the opportunity to decide for themselves whether culture or cost is the more important value in food choice. An even better idea: Let’s produce safe meat in the first place.